I’ve had a few days to play with the Dell SX280 Ultra Small Form Factor (USFF) PC that I bought on eBay for $90 some time back. It’s worth describing here, in case you’re looking for such a very small machine. 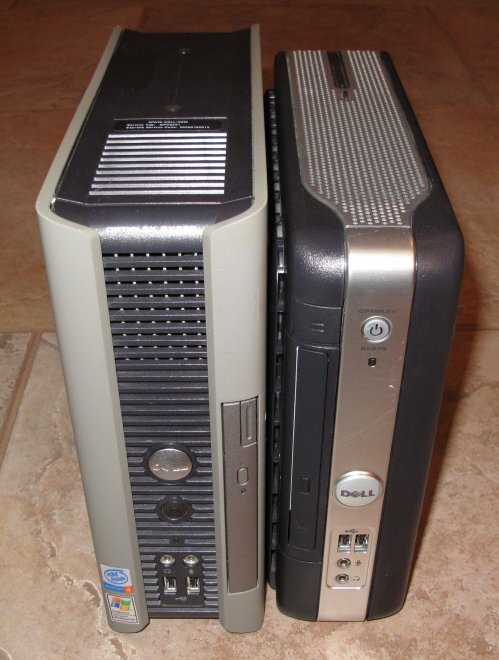 The one I got was a 2.8 GHz Pentium 4/512 MB/40 GB system with XP Pro installed. It came with a USB keyboard and optical mouse. Both the mouse and the keyboard look brand new; the PC itself has obviously been used, but it’s quite clean and has no stickum blotches on it anywhere. I’d say a pretty good deal for $90. The SX280 field strips very easily. The photo above shows what you’ll see under the side panel, with the bright blue plastic fan shroud removed. The SX280 is slightly larger (see photo above) and two pounds heavier. The SX270 weighs 7 pounds 5 ounces, and the SX280 9 pounds 4 ounces. 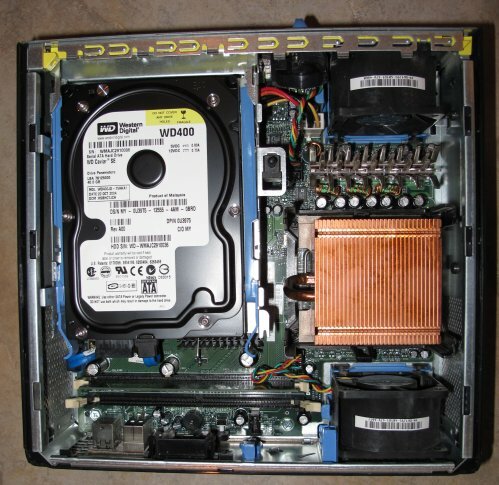 The SX280 uses 3.5″ SATA hard drives. The SX270 uses 2.5″ ATA hard drives. 3.5″ drives are cheaper, so that’s a plus. The SX280 hard drive is very easy to remove. You pull the power and SATA connectors and it lifts up in a tray. The SX270 internal drive uses a more fragile ATA ribbon cable and connector system. The removable drive bay is a different spec. Removable drives are not interchangeable between the two systems. The SX270 has a reasonable internal speaker. Not hi-fi, but if you’re not listening to music it does fine for system notification sounds. The SX280 has no internal speaker at all. The SX270 has PS/2 connectors on the back panel for mouse and keyboard. The SX280 lacks PS/2 connectors. You need to use USB peripherals, or get a PS/2-USB adapter. The SX280 has 7 USB ports. The SX270 has 6. Remember that on the SX280, at least one of those must be devoted to keyboard and mouse. Both systems have two internal slots for memory, but the sticks are not interchangeable between SX270s and SX280s. Both systems have Gigabit Ethernet ports, plus DB9 serial and DB25 parallel ports. Both systems use external power bricks. The SX280’s is about 25% larger and runs a little hotter. Given that the SX270 and SX280 can both be had in 3.2 GHz versions, the SX280 is a minor win, especially without the ability to tweak the graphics drivers for 16:9 widescreen modes. SATA drives and a newer Intel chipset is about all the SX280 has going for it, and if you can deal with the less vast and slightly more expensive hard drives, the SX270 is smaller and currently cheaper. The SX280 is going to the church office, and I think I’ll be sticking with the SX270 for other uses. Largely because of your recommendation, I have picked up a couple of SX270s and a SX280. They were cheap, from a guy in town that refurbishes them. My SX270s are loaded with Linux, so I can’t check, but the SX280 will run at 1680×1050 at least. It did not support that resolution with XPSP1, but the choice appeared after I loaded SP2 and SP3. 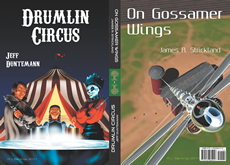 They are pretty good little boxes for fifty bucks – thanks for the pointer. The SX280 I just bought came with XP/SP3 installed, but it only appears to support four resolutions: 800 X 600, 1024 X 768, 1152 X 864, and 1280 X 768. I see no sign of 1680 X 1050, and I wonder if it’s detecting the Samsung display (native 1600 X 900) and not showing as options any resolution it figures is too far afield for the graphics system to handle. I just tried a Kubuntu LiveCD on the SX280, and it detects the 1600 X 900 display and sets the graphics accordingly. So the SX280 hardware can do that resolution without any trauma–it’s Windows that can’t seem to figure out how, even with the help of the PowerStrip utility. Still stumped. I haven’t tried the SX280 on a monitor with a larger display so I can’t be sure this is the case, but it’s a worthwhile experiment. I just drug up my Samsung 213T monitor from downstairs and hooked it to the SX280, and indeed, the list of available modes depends on the display attached to the machine. With the 213T attached, its native mode (1600 X 1200) is available, along with several others that will display as subsets of full resolution. The XP/SP3 drivers just don’t seem to have it in them to do 1600 X 1200. I picked up an SX270 as a cheap machine to do some surfing on the net and providing some music in my living room and it does the job brilliantly. i got it with a 2.8GHz P4 and 512Mb of ram however ive sinced maxed it out running a 3.4GHz HT Pentium 4, doesnt run to hot actually, however the system has ramped up the fan speed automatically which makes it a little noisy, the only down side. The big downside to the SX270 and 280 product line is the lousy graphics. These were designed as “fleet machines” for medical offices and other cube farms, where the primary applications are form-based transaction processors, spreadsheets, word processing, email, and so on. Video or anything requiring animated graphics will be slow and jerky. The graphics are integrated and there’s really nothing you can do to improve them other than top out memory. I’ll revive this old thread too with my gratitude for your comparison. I have the 270 and was considering buying the 280. After your review, I think the 270 is just fine for me (no real benefit to the 280 from what I can tell, aside from the HDD). The optical drive on the SX270 is the same form factor as the old Latitude C-series laptops. I happen to have a floppy drive sitting around for one. I also found a DVD+/-R on eBay, so mine is as modern as I need it. The optical drive on the SX280 is interchangeable with the Dell Latitude D-series laptops (D600, D610, D620, D630). The only thing I stumbled across in my research is the bad capacitor issue with the old SX270 machines (which may exist in the 280 and others — not sure). Mine had the capacitors replaced and has been a sturdy little Linux box ever since I bought it used in 2008. The SX270 I have has a 2.8ghz hyperthreaded. It gets hot but the fan doesn’t whirr like many have complained. I blew out a bunch of dust and have never had heating problems. It does radiate a bunch from the top. Maxed out at 2GB of RAM, it will eventually retire — but not this week. The small size and quietness make it a machine I can’t justify disposing. It runs Windows XP or Linux (Fedora 14) wonderfully! Thanks again for the awesome side-by-side! You’ve inspired me to check eBay prices for another SX270 now!! Hi Jeff, do you know if the SX270 has internal USB Ports on the Mainboard? I want to use an internal USB Stick as secondary HDD for my SX270 but can’t find a suitable mainboard manual… Maybe the needed pins for internal USB needs to be soldered to the Mainboard, but where to do this? I don’t have schematics for the mainboard so I can’t help you much here. Theoretically you could add a port to the internal USB hub by brute-force soldering, but I’ve never tried that and don’t know what it would involve in terms of extra parts. The old USB Complete book by Jan Acelson may help with the technical backstory, but I wouldn’t attempt it if you aren’t already pretty adept with computer hardware. That said, please post back here if you manage to pull it off!